Raymond Campbell was born in 1956 in Surrey. He was convinced even as a schoolboy that he could make painting his way of life. Raymond has exhibited in group exhibitions at home and abroad and has been successful with exhibitions held at the Royal Academy. His exhibitions are enormously popular and for many years have completely sold out. His career has built up from the late 1970's when he returned to the UK after studying and travelling through Europe. Raymond was greatly influenced by the great Dutch masters who inspired him to paint his still life in the Flemish tradition. He has now developed his own individual style that is widely recognised and greatly admired. A self-taught artist, he began painting as a hobby, which was initiated by his mother buying him a set of paints and brushes for his birthday. In the early days landscapes were the main subject along with portraits of people and animals, all of which kept him honing and developing his skills. Later, in the late seventies, he became self-employed and a full time professional artist. Still life subjects began as a result of his interest in antiques; setting up a subject matter of fruit, china vases, silver bowls etc. 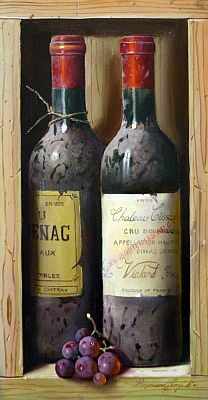 Later because of his interest and love of the history of wine and of the different vintages this subject was added to his repertoire. 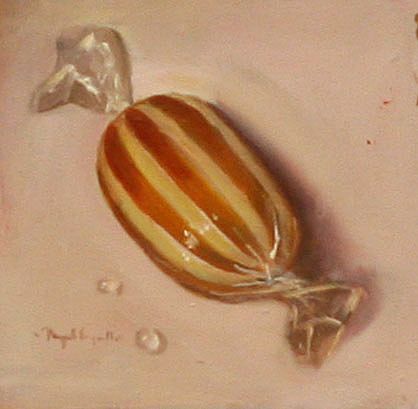 Raymond’s work has sold worldwide including the U.S.A. and Australia. He has a great following in the U.S.A. in particular. Last year one of his paintings was accepted at the Royal British Artists exhibition in London. His work is also widely published in Ltd and open editions. I can't help but get drawn deeply into the things I like to paint. I begin my painting and am immediately lost in it. With a landscape - I feel it around me - I get pulled in and want to walk to the bend in the lane or through the gate and into the field or over the far rise of a sunlit hill. The same thing happens in my still lives. 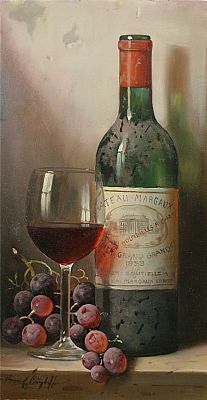 As I paint the dusty wine bottles with the glass of deep ruby red wine or chilled Chardonnay with a cold moisture drop drifting down the glass I can actually taste it in my mind. 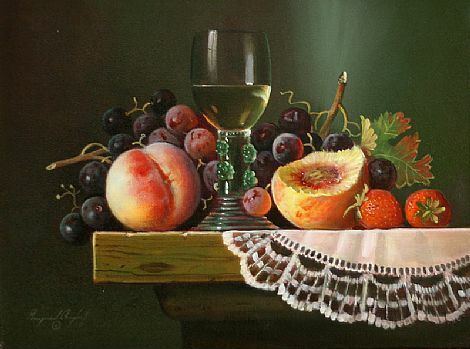 The fruits too, the peaches and the plums - I paint them as luscious as I know them to be. And the cheeses as deeply flavoured. I want people to feel they want to reach out and taste. This is the "truth" I search for and the passion that drives me and I hope that this shows in my paintings.